Helps eliminate right front blind spot. 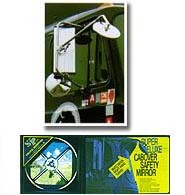 Eliminates right side blind spot. With proper use, it virtually stops right turn and lane change accidents. Bell-type mounting assembly has 3" coating washer between bell and fender and heavy 3" steel washer for underside of fender, which eliminates damage to fiberglass fenders. Designed to fit all conventionals. All Fastners are 18-8 stainless Steel. All triplex nickel and chrome plated for lasting beauty. Bell-type mounting assembly has 3" coated washer for underside of fender which eliminates damage to fiberglass fenders. Designed to fit all today's aerodynamic rigs. All Fasteneres are 18-8 stainless steel. 883 Assembly includes 8" Convex Mirror Head. Triplex nickel and chrome plating for lasting beauty.